Let me begin by saying that this is one of the best books I've read this year. It touched me deep inside both as a parent and as a professional. I'm a Special Care Counsellor, and I have encountered mental illness both in my extended family and in my field. I quickly realized as I began reading that this is an important book, which is one of the reasons I made a request to the author to review it. I had no idea what to expect when I received it, but I didn't think it would be so good, so well-written, and so insightful. Although non-fiction, it is a highly readable book and almost felt like I was reading a novel. It gripped me from the first page and I was riveted throughout. The pace, the dialogue, the added information boxes, and Randye Kaye's own writing is amazing. She builds a portrait of her son, Ben, from early onset when no one really knows what is going on with him to his diagnosis and subsequent recovery. The flow of the story is smooth and I easily had a mental picture of the progression of the illness. 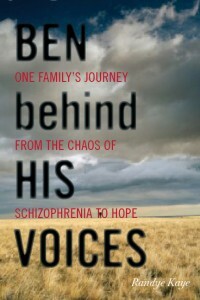 I appreciated the fact that although the author is a well known radio personality, she did not stray from the story of Ben and how schizophrenia affects a person, their family and their lives. This book is not about her, but about a mother trying to help her son who is eventually diagnosed with schizophrenia. It is a story any person, whether a sufferer or a relative, can relate to. It made me appreciate the role of family in helping a person recover from mental illness and it made me love my children more. It raised my empathy for families who deal with mental illness. Most importantly, it raised my awareness of schizophrenia, a mental illness that still has a stigma attached to it and is little understood. Early detection is so crucial and thanks to Ben's story, I now know what some of the signs are for detecting schizophrenia. I want to thank not only Randye Kaye for this very honest portrayal of her son's illness but also her son Ben for allowing us to glimpse at his personal struggles, his fears, his pain, his mental anguish. As I read this book, my heart ached for Randye and for Ben, as well as Ali his sister, but it also rejoiced with them for their successes, their courage, and their advocacy. It is a hopeful book, and one that I will actively promote to all I know. I already have a list of friends waiting to read it as I have been highly recommending it to everyone. Whether you are a parent, educator, or a reader simply interested in learning more about mental illness, please read this book. It will change you. It will help you understand the world of mental illness, and if you are dealing with someone with mental illness, it will help you see the light at the end of the tunnel. Note: There are a few f-words in this book during high stress scenes but I barely noticed them. And that's a first for me. Disclosure: Thanks to the author and Rowman and Littlefield Publishers for sending me this book for review. I was not compensated in any other way, nor told how to rate or review this product. We have a child with Schizophrenia. This will be added to my TBR list. Thanks for hosting the book. WOW. You certainly made me want to read it despite the language. That's a tough one to deal with for sure. Have a wonderful week and happy reading. It sounds like this book is extremely well written. Mental illness is such a taboo topic and it really shouldn't be. I'm making a note of this book. This sounds like a book that needs to be read!!! I have just reached chapter 12... This is not my usual genre of reading but it had been recommended by a friend. I cannot put the book down!! It is very well written and easily peaks my interest. The intrigue - the twists and turns - the ups and downs - the challenges - the raw emotions – the patience - the stamina. WOW! I find myself wanting to hurry to the end hoping to find a happy ending. I am recommending to this book to my friends and family. I wish you and your family the best of luck in your journey! Yes, it's hard to put down especially because it's a true story. I felt the same way when reading it. Thanks for visiting my blog! and thanks for reading the book!